1. Make sure that your phone is on, paired, and linked to HFL. 2. Press the CD/AUX button until you get to Bluetooth® Audio mode. 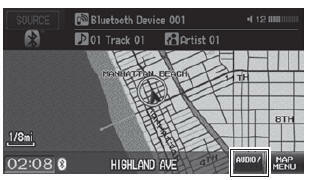 ► A Bluetooth® message and icon are displayed on the display and screen. 3. Select AUDIO/STREET until AUDIO is highlighted in blue. 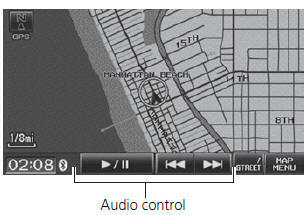 ► The audio information is displayed at the bottom of the screen. 5. If necessary, follow the cell phone operating instructions for playing audio tracks. Check the following if the phone is not recognized: • Another HFL-compatible phone, which is not compatible for Bluetooth® Audio, is already connected.